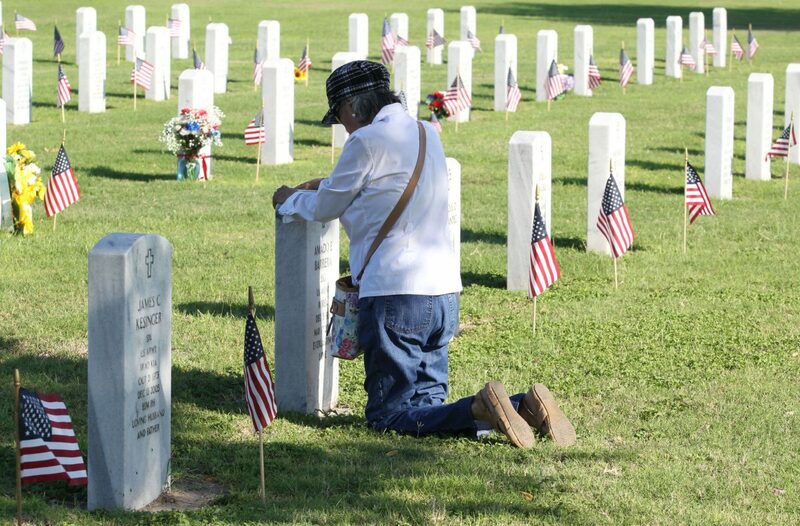 Rita Barrera of Palmview kneels at the tombstone of her husband, Amado Estrada Barrera who served in the US Army Korean war during a Memorial Day ceremonies at Rio Grande Valley State Veterans Cemetery in Mission on Monday, May 28, 2018. MISSION — With red, white and blue artificial flowers in hand, Idalia Gonzalez sat beside the grave of her son, U.S. Army Spc. Alex Gonzalez, on Memorial Day morning. Gonzalez, a Mission native who was part of the U.S. Army 3rd Mechanized Brigade stationed out of Fort Hood in Killeen, was killed in 2008 when Iraqi-insurgents launched a grenade attack on his armored carrier in Mosul, Iraq. This month marked a decade since his death — the 10th Memorial Day for Idalia Gonzalez without her son, who died at the age of 21. Hector Vargas a member of the VFW Post 8788 plays taps during a Memorial Day ceremony at Rio Grande Valley State Veterans Cemetery in Mission Monday, May 28, 2018. Nora Rodriguez, the late wife of Reynaldo Rodriguez wept nearby as she listened to the national anthem in front of a white marble headstone belonging to her late husband, Reynaldo Rodriguez, a Vietnam veteran and Alamo native. 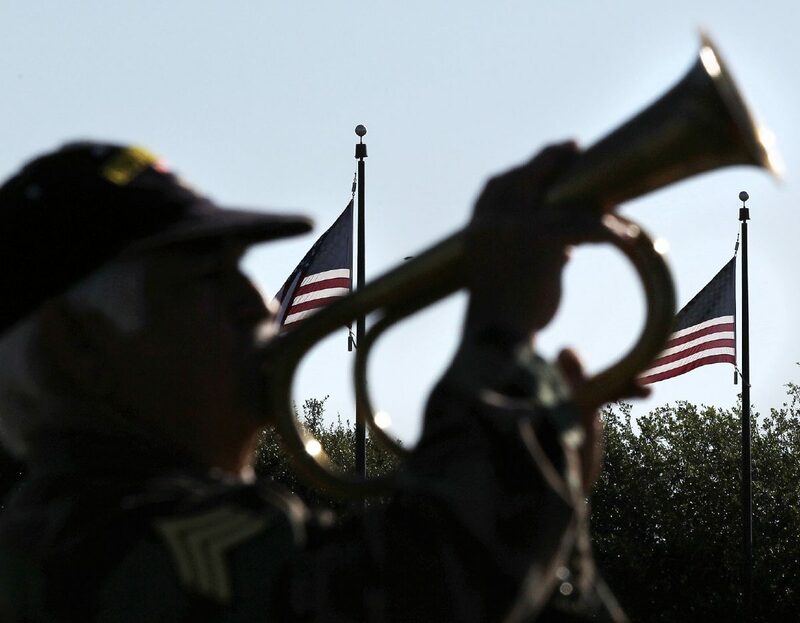 Rodriguez, Gonzalez and dozens of others gathered Monday at the Rio Grande Valley State Veterans Cemetery in Mission to remember those who died while serving in the military. “ It’s just kind of something that I think is respectful,” said John Egan, a Weslaco resident and 27-year veteran of the armed forces. The ceremony began with the national anthem while the flag was raised by VFW Post 8788. “ I feel so honored that they came and gave their respects,” Gonzalez said of those in attendance, like Egan. A wreath representing eternity and other symbolic items, like salt for tears shed by loved ones, served as a reminder of the sorrow experienced by family members and loved ones. The ceremony concluded with a 21-gun salute, taps and a closing prayer. “ He sacrificed, but he saved a lot of lives,” a woman told Gonzalez following the prayer. Gonzalez’s mom, sister, aunt and cousin then sat by his grave, which was one of the first few at the cemetery in 2008. Idalia Gonzalez recalled how her son, who she and her husband adopted when he was about a year old, wrote a report about the military in high school, which detailed how he wanted to enlist one day, like his father who was in the Army. She also recalled the day members of the military showed up to her front door to deliver the death notification 10 years ago. The road they lived along together was changed this month to Alex D. Gonzalez Street.